We lose an hour of time this weekend here in the UK and you’ve probably seen the meme doing the rounds on social media. It’s meant to be funny but most mums I know are only laughing out of hysteria. The thought of ‘losing’ an hour fills them with dread. 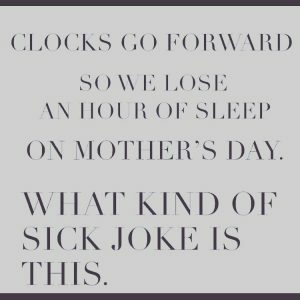 Not only because it’s highly unlikely their children’s internal body clock will adjust with the start of British Summer Time! But because they don’t feel like they have an hour of time to lose in their lives!! If you’re feeling the same way too, I wanted to share something with you that I hope eases your relationship with time. I want you to know that if you feel like you’re constantly fighting time. If you feel like there’s never enough of it. It’s not your fault! It’s not that we are failing in some way. Sure, we can all make tweaks to use our time a little bit more efficiently but fundamentally that’s not the problem. The problem is that we’re trying to run a race that we can’t win. The rules of the game are rigged against us. And we will never feel in flow with the time we have in our lives by playing by the current rules. by our 24/7 global living. And the more we fill our lives with time-saving devices and time-saving strategies, the more rushed we feel. Unless we start carving out our own tempo in life we’re constantly vulnerable to the distractions and manipulation of our time by things and people (time thieves). We have to change the rules of the game for us to thrive as working mums. So let’s put down the stick that we use to beat ourselves up with and start drawing out the new rules. Because the truth is that we have more time at our disposal than any previous generation. Our life expectancy is now the highest in living history…….but how we translate those extra years into quality time in the here and now is the dilemma we face. Here at Wisdom For Working Mums I’m committed to help women like us rewrite the rules of our game so that we can start to experience time freedom not time poverty. Not only do we deserve, it but I’m hoping we can change the game for our children’s generation too. If you’d like some insights into how you can start to changes the rules of the game check out my latest podcast from the author of Enjoy Time, Stop Rushing and Get More Done! In the meantime I hope you and your family can flow with the clock change this weekend. If you know a working mum who struggles with her time please share the truth about time with her, so she too can know she’s not failing.